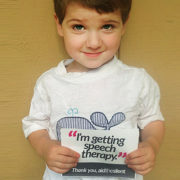 In preschool Kristopher’s speech therapist raised the concern of abnormal speech sounds she couldn’t explain. The ENT found he had very mild loss. This past fall it started to become clear his hearing issues were not mild. Tests showed he had mild to moderate loss. Health tests show his hearing is moderately severe. Genetic testing was done try to find cause of all his hearing loss. We are still waiting on those test results. He is currently adjusting well to his hearing aids. 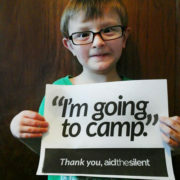 He is looking forward to camp this summer, thanks for helping make it a reality for him. We got assistance with an FM system! I heard about Aid the Silent through an interview with Emma Faye Rudkin. I was so impressed with her and so thankful for an organization to help our hearing impaired kids! 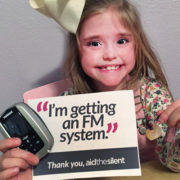 When my daughter was about to begin first grade I applied for an FM system. Honestly, I was not even sure that I would be contacted. I was so wrong! Someone from Aid the Silent personally emailed me to make sure our application was complete. A few months later we got the great news that we had been approved for assistance with an FM system! 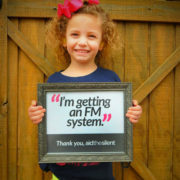 We are so thankful and love seeing how much our daughter loves her FM system. She honestly does adore it. We appreciate you, Aid the Silent. I’m getting an FM System! 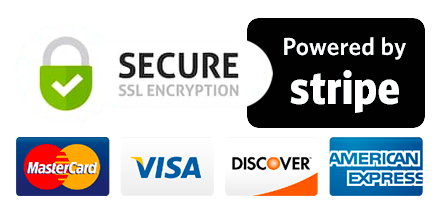 When I first stumbled upon Aid the Silent, it was to apply for a sponsorship to possibly receive financial help in purchasing technology related to hearing loss. I thought, why not? 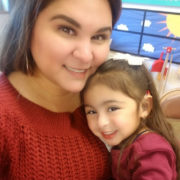 After submitting the application and upon receiving the first email that my daughter, Harper, was a candidate for a sponsorship, I couldn’t believe what was happening. Harper, age 4, has bi-lateral moderate hearing loss with difficulties from auditory neuropathy. An FM system, along with hearing aids, allows her to focus and comprehend language in a noisy environment. 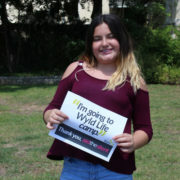 "I am going to Wyld Life Camp"
Sometimes there isn’t a clear purpose to our struggles and the real purpose is to carry our struggles with dignity and grace. Emma Faye Rudkin told me as we sat under the dining hall porch at Young Life camp this past summer. Emma Faye and I have very similar situations, we¹re both deaf/hard of hearing. Although 5% of the population is deaf/hard of hearing it’s very difficult to find other deaf people, and even harder to find ones you relate too. 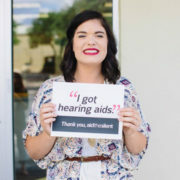 I knew of Emma Faye before through Aid the Silent, a Christian ministry for the deaf/hard of hearing that Emma Faye founded and I also knew of her through the Miss Texas pageant she competed in. Emma Faye first caught my attention when I watched videos of Aid the Silent promotions because she was around my age and embraced her deafness immensely, something none of the other deaf people I knew did. When I actually met Emma Faye in person the first thing I noticed about her was how content and peaceful she seemed, not just with her deafness but with her life in general. The second thing I noticed was that Emma Faye was a true beauty queen; she was naturally gorgeous but she always had her hair in big curls and full makeup on, including her signature red lip. Even when we went on four mile hikes at camp Emma Faye looked all done up. I also noticed how accepting Emma Faye was of everyone and everything, all week at camp she never left anyone out and immersed herself in all sorts of people. I can truthfully say that Emma Faye is one of the best people I¹ve ever met. Deaf/hard of hearing people are the third most unreached by the Gospel of God. I personally wouldn’t say I was entirely unreached but they definitely don¹t teach you in church why people have disabilities and no one can or wants to teach you how to ask God the hard questions. be listening to me because I wasn¹t getting answers. 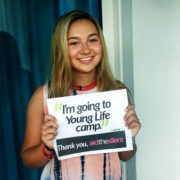 Then one day everything changed, my mom came home told me that Aid the Silent had offered me a scholarship to go to Young Life camp with a group of teens from Texas I didn¹t know, including Emma Faye. 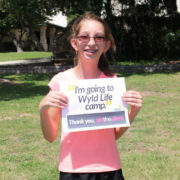 At the time of camp I was very shy and had a fear of mispronouncing something in front of people who didn’t know my situation, so I told my mom that camp didn¹t sound like something for me. 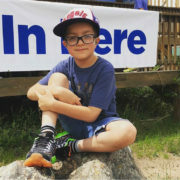 I think it was a mixture of God and my mother¹s stubbornness that pushed my mom to make me go to camp and, thankfully, for the next couple weeks my mom spent almost every waking moment convincing me to go to camp. 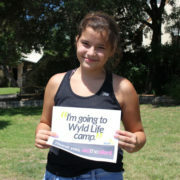 Until one day my mom told me I had no choice in the matter, I was going to camp. I cried and fought with my mom for weeks; my mom would start the fight by making a joke to my friends about me going to deaf camp, I usually followed with a smart comment explaining that I wasn't. This always lead to a screaming where I would state my case that she wanted me to be more like Emma Faye and less like myself. 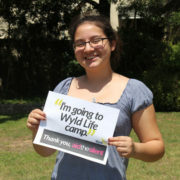 Of all the things that had ever happened to me, I thought being forced to go to camp was the worst. "I am going to camp"
My name is Connor. I am 2 years old and have two older brothers. When I was born, I failed the newborn hearing screening in the hospital. 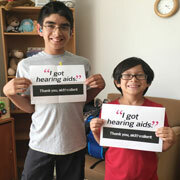 My parents were shocked because hearing loss doesn't run in my family. After months of testing at 9 months old, I was finally diagnosed with moderate to severe bilateral sensorineural hearing loss. 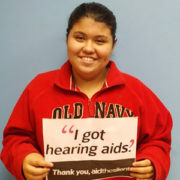 I was fit with hearing aids that day and my parents were told I needed to start going to speech therapy ASAP. My parents took me for my initial consultation and soon thereafter received a letter from our insurance saying they would not cover my visits. This made my mom and dad very nervous. They knew I needed this in order for me to have the best possible chance at developing spoken language like my peers. My mom stumbled across Aid the Silent on Facebook and saw where they have a sponsorship program for kids just like me! She applied for assistance to help with the speech therapy costs and thankfully they approved the request!!! My hearing loss recently progressed to a severe to profound level and I became a candidate for a cochlear implant. 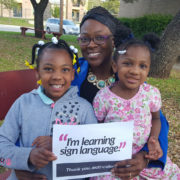 I was implanted on April 22nd and thanks to Aid the Silent I am able to regularly go to speech therapy to learn how to talk just like my big brothers." Hello my name is Benjamin Evans and I am 5 years old. I have three other brothers. Out of the four of us three of us have a permanent sensorineural hearing loss requiring the use of hearing aids. My dad and mom knew I would need an FM system to have equal access to hearing in Kindergarten which I will start this fall. Our insurance doesn’t cover FM systems so my dad and mom were getting a little nervous as to how they would be able to provide me with something I desperately would need come the fall. 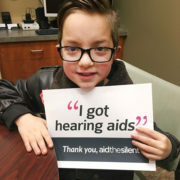 My mom stumbled upon Aid the Silent on Instagram and saw that they try to help as many people as they can so that they too could have equal access to hearing. So my mom filled out an application asking for assistance. Aid the Silent was quick to respond and so friendly. We qualified for them to help me!!!! I am getting an FM system through Aid the Silent and I couldn’t be any more happy!! Thank you Aid the Silent for everything you do.